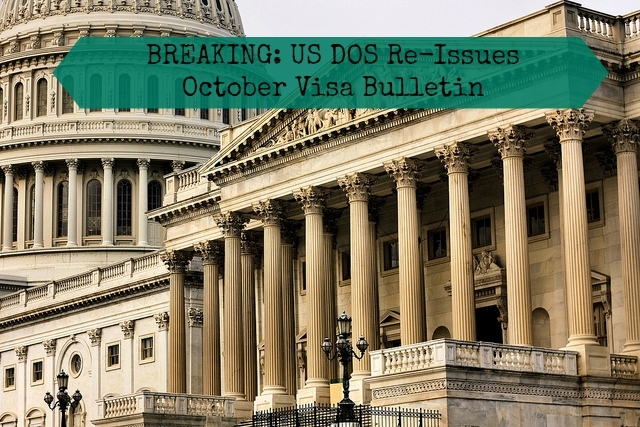 BREAKING: US Department of State Re-issues the October Visa Bulletin: What Next? As some of you may have heard, on September 25th the US Department of State made some additional changes to the October 2015 Visa Bulletin. These changes include new and earlier date of filing cut-offs than those initially released on September 9th. The date of filing chart released on September 25th will replace the prior one released on September 9th. To view the complete changes please click here. These new changes have raised several concerns for our readers. What caused the visa numbers to be re-issued after their release on September 9, 2015? Though we cannot ascertain the exact reasons why these changes have come about, we can make the fair assumption that these changes were likely due to workload concerns and a lack of resources necessary to accommodate the large amount of adjustment of status applications expected to be filed beginning October 1st. The anticipated workload may have given the Department of State no choice but to retrogress the visa numbers in heavily used categories. Is the Department of State reneging on their promise to modernize and streamline the immigration process as part of Obama’s executive actions on immigration? While it is disappointing that the visa numbers on the ‘date of filing’ chart have retrogressed, a departure from the promised executive actions does not seem to be the case. The visa numbers have been adjusted in an effort to streamline the immigration process in a way that is viable, practical, and effective. Dates of filing have been adjusted for family-sponsored and employment-based preferences to create a practical timeline that provide CIS the sufficient time needed to process the large volume of anticipated adjustment of status applications. Even so, the new dual chart visa system will still allow eligible applicants to file their adjustment of status applications sooner than before. Previously, foreigners could not apply for adjustment of status until a visa became available to them. As more resources are allocated and systematic measures are implemented, the Department of State may continue to make adjustments to the chart which will allow more foreign nationals to benefit and apply for their adjustment of status applications and employment authorization cards. Political pressure may also force the DOS to abide by the initial date of filing chart. The DOS has at least taken a step in the right direction, even if it did so without considering the manpower such an initiative would require. Now that these changes have been made, what should I do now? Foreign nationals must be prepared to file their green card applications at all times by organizing all documents necessary for filing, even if the filing date chart indicates that you cannot yet file your green card application. The DOS may continue to make adjustments to the ‘date of filing’ chart as it prepares for the influx of applications that it will receive. You may be eligible to file your green card application before you know it, if more changes are implemented. Preparing early on is the best and most cost-effective strategy. We do not recommend filing your adjustment of status application based on the September 9, 2015 date of filing chart. Foreign nationals who do so risk their applications being rejected by CIS, since the new September 25, 2015 dates of filing take precedence. Want to pressure DHS and DOS to reinstate the dates of filing released on September 9th? We urge you to write to your Senator, Congressman, and/or USCIS Ombudsman’s office. Prediction: Heavily used categories will likely not be adjusted in the near future unless immigration advocates and other stakeholders successfully pressure the Department of State to abide by the date of filing chart released on September 9, 2015 on the October Visa Bulletin. We will provide our readers further updates as they become available. Have Questions? Please contact us, your immigration is our passion. UPDATE: Today, September 28, 2015 the American Immigration Lawyers Association issued a letter to Secretary of State John Kerry, Secretary of Homeland Security Jeh Johnson, and Director of the Domestic Policy Council Cecilia Muñoz urging them to reinstate filing dates published on the September 9th Visa Bulletin. Lawmakers and other stakeholders are currently pressuring the DOS and DHS to act immediately.